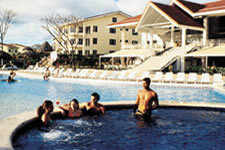 The Hotel Barcelo Playa Langosta is situated on a beautiful beach in the south of Tamarindo. Ideal for surfing, scuba diving, and nature lovers, this resort is also ideal for families and couples on holidays. The comprehensive "Barcelo All-Inclusive" package is the ideal way to enjoy all the services, activities and facilities offered at the hotel. The hotel includes 2 restaurants, á la carte and buffet, an adult and children's swimming pool, a children's playground, Jacuzzi, a beauty treatment room, massage service, a jeweler's, a nightclub and a casino. The 134 well appointed guest rooms at the Barcelo Playa Langosta each have two double beds or a King-size bed, a balcony or terrace with views overlooking the sea or gardens, air conditioning, a fully equipped bathroom, a mini- fridge, coffee maker, TV, telephone and safe. Services offered by the hotel include a daytime and nighttime entertainment program. There are also facilities for a number of sports, such as beach volleyball, table tennis, aerobics, boogie boards, scuba diving, snorkeling, kayaking and fishing. The 134 well appointed guest rooms at the Barcelo Playa Langosta each have two double beds or a King-size bed, a balcony or terrace with views overlooking the sea or gardens, air conditioning, a fully equipped bathroom, a mini- fridge, coffee maker, TV, telephone and safe.